Plaxo Prepares To Launch Pulse Social Network – Will Users Trust It? So Plaxo’s new social network, called Pulse (we wrote about it last month), is still extremely buggy. Robert Scoble and Matt Marshall say it launches properly on Monday, so hopefully they’ll have the kinks worked out by then. For now, it’s live but doesn’t really work. Nick Gonzalez loves the fact that Pulse is an open platform and compared it favorably to Facebook. I don’t disagree with what he wrote. But I noted some fairly venomous comments to that post by readers who say they can never trust Plaxo after all of the spamming complaints in the company’s early years. 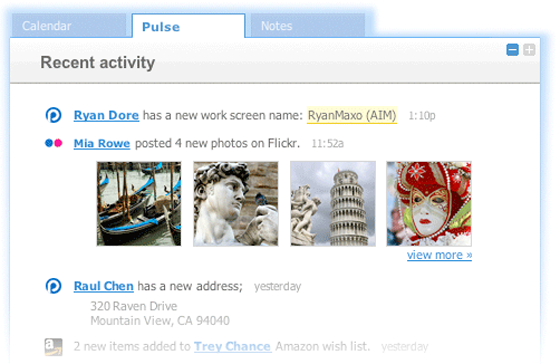 Will users flock to Plaxo and use Pulse in the same way that they use Facebook today? I don’t think they will. Facebook invented the news feed for social networks. Playing catch up is always hard. And when you are still fighting reputational issues, it becomes harder still. Even so, I’ve created a new account at Plaxo after long ago abandoning the service. I like that the news feed is not limited to Plaxo applications, and I intend to give it a fair shot. Perhaps it will steal some of my attention away from Facebook. We’ll see.